If you're looking for the perfect gift for your biggest baseball fan, check out these ideas! 1) Custom Printed Baseball - How cool is it to have your name/number on your very own baseball, just like the pros? - I bet this league will forever cherish this momento, along with the memories of the 2017 season! 2) Baseball Bat Bottle Opener - There are many different versions available on the internet - Some actually are pieces that were used in real major league games! 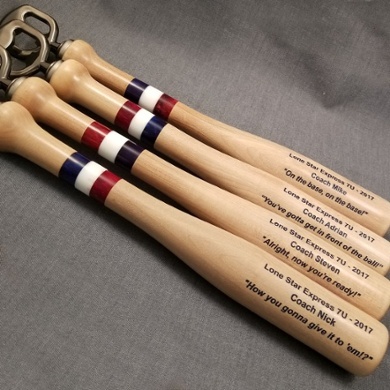 These images below were custom made for the coaches and engraved with a special message. 3) A Memorable proposal - isn't this the sweetest? 4) A leather wallet made from an old baseball glove - You are not going to believe this. Its one of the coolest products I've seen for diehard baseball fans. You can check them out at Money Mitts. Personalize with a name and date and you'll have brownie points forever. 5) Engraved Baseball Glove - This one has endless options for customization. Nicknames, favorite numbers, signatures, special messages... you name it. This will be a special treasured gift for years to come. So when looking for your favorite baseball fan a gift, look no further than the baseball basics with a little personalization flair. We actually engrave some of the items for TriStar Productions. Their online store is every sports fans dreams come true. Baseball fan? Football Fan? Basketball and more! They've got you covered! For more ideas on custom engraving, check out our gallery. There are a TON of ideas from projects that we have worked on. If you have ideas and would like to request a FREE quote, we would be happy to help you out.